My name is Sheldon Zhu. I will be a junior this fall at South Pasadena High School. My passions are math and physics. I hope to work in experimental physics, as I prefer more hands-on work. In my free time, I like playing video games with my two brothers. 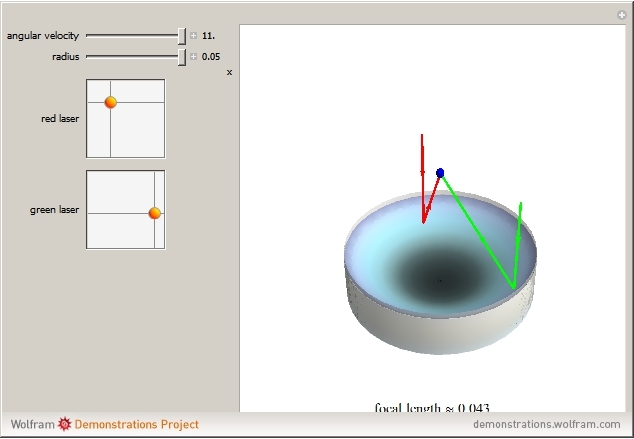 This Demonstration shows a simulated liquid mirror. By rotating reflective liquids, a paraboloidal shape will be formed focusing any light toward a common focal point as shown by the lasers. The speed at which the liquid rotates affects the curvature of the paraboloid, as does the radius of the container itself. Such mirrors have been used in telescopes because it is much cheaper than a traditional glass mirror, although it has to point straight upward.